I had to return quickly to Sabor to make sure that first visit hadn't just been a nice dream. It so easily could have been given that the restaurant has been 11 months in the making and its opening so eagerly awaited. 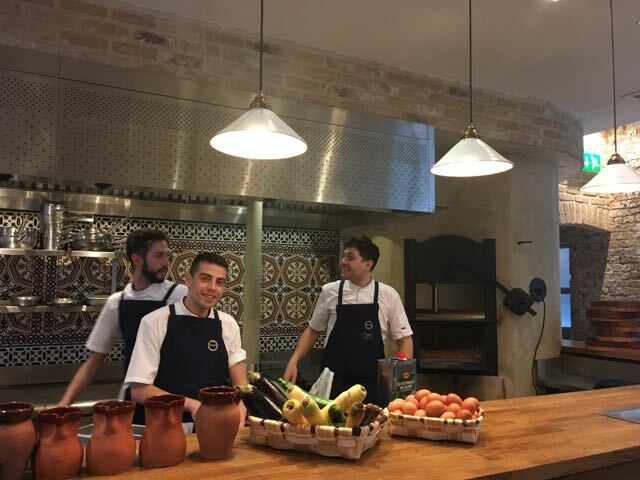 On my visit last week, their first day open (something I almost never do), everyone involved was on their toes and ready to perform, though there was a palpable and endearing nervousness to the lunch service. Food and service were spot-on. After a second visit, slipping into that seat at the kitchen counter already felt cosily familiar. Undoubtedly the way I feel about Sabor is due partly to the fact Nieves Barrágan Mohacho is in charge in the kitchen and that José Etura is orchestrating front of house. Until March 2017 both were mainstays of the much-loved Barrafina Group of tapas bars where Nieves earned a Michelin Star. I noticed a few other staff have migrated a little further west to Sabor. 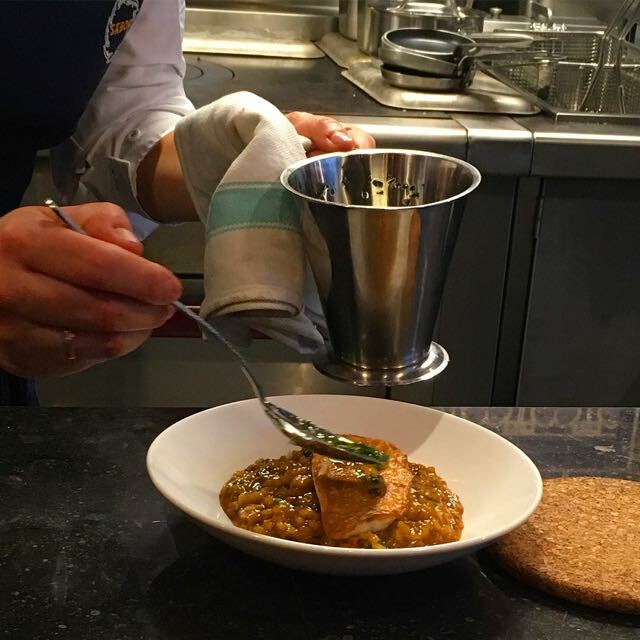 Barrafina are great at what they do but after 10 years, it's good to see Nieves able to give free-rein to her Basque roots at Sabor, and to see José spreading his talent for great service. At time of writing the first-come-first-served ground floor restaurant, which wraps in an L-shape around the kitchen, is open. Groups of up to 4 can be accommodated and the small bar alongside, is also open. The cooking ranges from Andalucia through Galicia to Castile. The upstairs, bookable, Asador space is to follow at the beginning of March. Here the wood-fired oven (the Asador) will be roasting Suckling Pig and two enormous copper pans will be the cooking Octopus for traditional dishes the Castilian and Galician ways. Sabor translates into English as flavour and it's this that Nieves does so well. There's a daily menu which changes slightly according to seasonal variations plus a specials board. Pan Tomate Cecina was a slice of toasted bread topped with the juiciest tomato, expertly imbued with flavour despite the time of year, and topped with wafer-thin slices of jamon. You have to have it. And, of course the Tortilla. We tried two, one with Jamon and Artichokes and, on the next visit a Salt Cod version - both wonderful. Piquillo Croquetas, Zamorano were crisp as could be and mildly spicy with a buttery nuttiness from the Zamora province sheep's milk cheese. The Arroz con Salmonete (Red Mullet) dish pictured above was, sadly, someone else's order. Top of my list to try next time. We opted for the special of John Dory, which came with its fillets diced, tossed in flour and pimento then deep fried. The deep frying of the head and skeleton, on which the fillets were then re-arranged was appreciated for the opportunity to fish-out the cheeks. A tasty plate but, for me, the presentation didn't show the fish to its best advantage. Our portion of Presa Iberica 5 Jotas, Mojo Verde, was served with slivers of crisply-fried parsnip and was a juicy chunk of just pink pork on a bed of the traditional zesty coriander-based sauce. 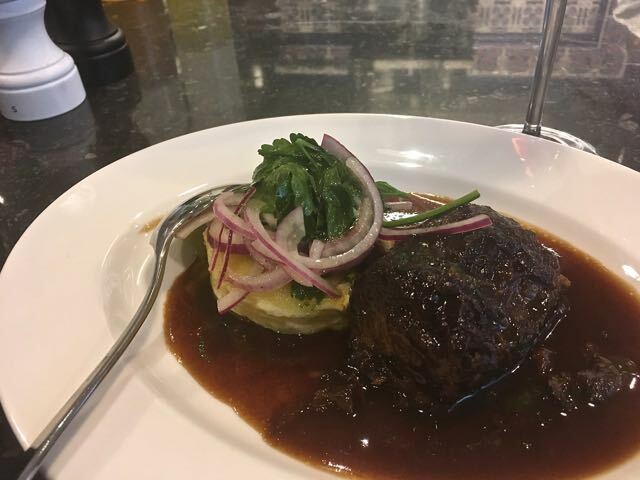 The Rabo de Toro (oxtail) was yielding and sticky from the richness of the sauce, the creamy potato side which came with it was expertly cut by a few slices of raw onion. Sublime. The list of puddings is short but considered. Seasonal rhubarb came in the form of Rhubarb and Mascarpone Tartaleta which made a very pretty plate - not yet tried. Goat's cheese ice cream with Liquorice Sauce is an interesting combination. 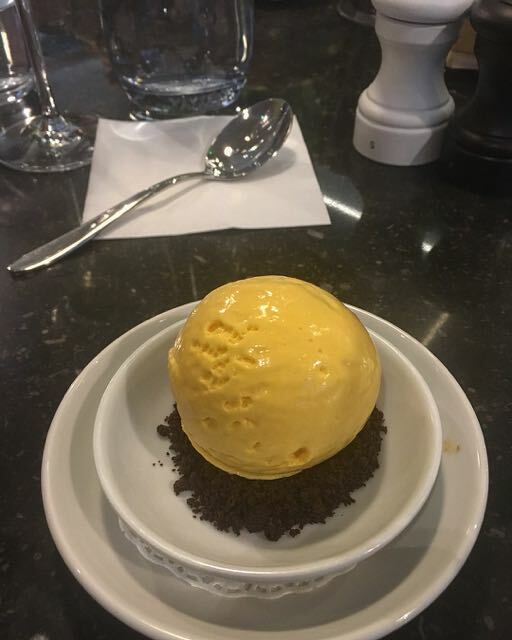 Based on having tried the beautifully balanced Honey and Saffron Ice Cream, I look forward to trying it. Cuajada de Turron, Oloroso Cream seems to be destined to be a fixture on the menu as it is so good. As far as wine is concerned, so far the Páramos de Nicasia from Rueda and the Pasion de Bobal have been excellent choices. 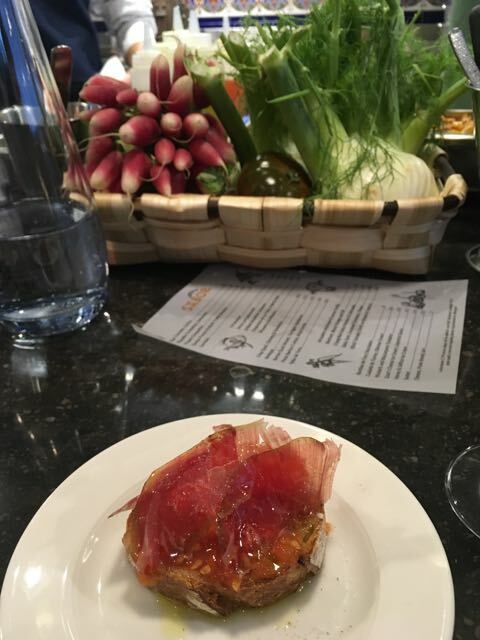 The list looks well worth exploring and Sabor Bar offers Spanish Vermouths, gins, sherries, txakolis, wines and beers to drink along with slices of Jamón Ibérico 5 Jotas, Ox tongue Carpaccio and little plates of Camarones fritos & fried egg.